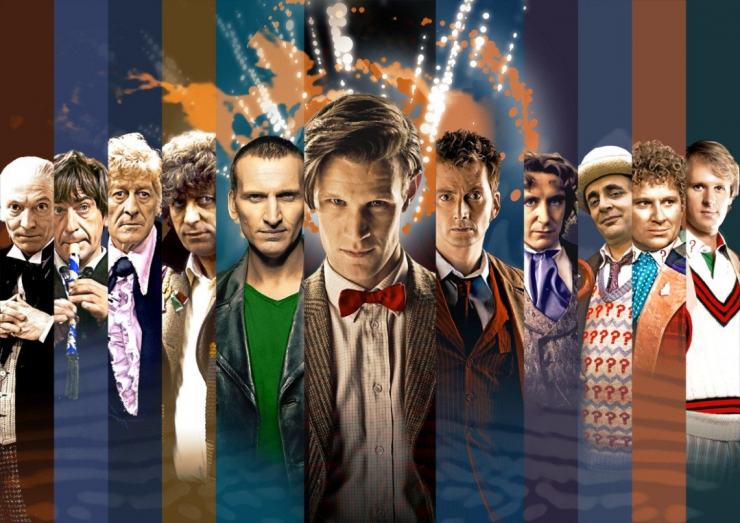 Speakin' Geek: The Doctor Who 50th Anniversary: My all time Top Ten. The Doctor Who 50th Anniversary: My all time Top Ten. This week saw the release of the 50th Anniversary Doctor Who trailer. As a way to celebrate this release and the 50th anniversary special I have decided to give you the 10 greatest Doctor Who episodes( in my opinion of course). I won't even try to cover the 50 years which would include William Hartnell, John Pertwee and the other early incarnations of the Doctor. No I will simply be covering the years of Doctor's 9 - 11. Here are my Top Ten episodes of Doctor Who. Season four was a great season. With Donna Noble now the Doctor's companion we had a great back and forth between two funny characters. As the season went on we learned how much of a diverse and interesting character Donna was and this episode was no exception. Silence of the Library and the Forest of the Dead are in this list because it has the beginning of one of the most unique love stories I have seen in a long time and yes I am definitely including Twilight. With the introduction of River Song we were given a character almost as mysterious as the Doctor and with the Vashta Nerada as the insatiable monster of the week we had one of the most heartbreaking episodes in Doctor Who and that's saying something. This two parter is in the Top Ten list because of the heart at the centre of this arc. Ah Rose Tyler. The first modern companion. She was my first companion, until 2005 I had never gotten into Doctor Who but then I saw that first episode, Rose, and I fell in love. I imagine that's how the 9th felt. After all the death and destruction he saw, and caused, I'd like to think Rose was a life line for him. She brought him back from the dead and that's why when he regenerated he could share more of himself with her. All of this brings us to Doomsday, Cybermen to the left of them, Daleks to the right and there they were, Rose and the Doctor. Saving humanity and loving every moment of it. Then the unspeakable happened, they were separated. Rose had her family and was safe on a parallel Earth and the Doctor had no one. When the Doctor and Rose have their final conversation on the beach your heart just breaks. She should have been a companion. We're in to season 3 for this episode. The current companion is Martha Jones and the 10th Doctor is our chaperone across all of time and space. Blink is a unique episode because the Doctor is only seen sparingly. Our hero is the wonderful Sally Sparrow( Carrey Mulligan), a girl who just seems to be adorably inquisitive but unfortunately has the worst luck when it comes to getting involved with Doctor Who monsters. Why you ask? The answer is simple, Sally has come across the Weeping Angels, the most terrifying modern Doctor Who villain. They have the ultimate defence, when something is watching them they become statues but when you blink they are unnervingly fast and that's when they get you. This is a great single episode that could have easily been a two parter, but somehow everything was perfectly squeezed into one 45 minute episode. If there was one complaint I would say it's this, Why didn't Sally Sparrow become a companion? Such wasted potential. We're at season 5 now, current companion Amy Pond(the wonderful and beautiful Karen Gillian) and our Doctor is the 11th. This episode is one of a kind for me. When we are given interpretations of historical figures they are always interesting but this one in my opinion stands head and shoulders above the rest of them. Vincent Van Gogh and monsters, who knew it could make such a compelling and emotional roller-coaster of an episode. So the Doctor is giving Amy a little tour of the Van Gogh exhibit when they happen across a painting which seems to have an intruder in it. They travel to Van Gogh's time to interview the painter. When they arrive they find a tortured soul, a broken man who only wishes for his work to be acknowledge but fears it never will be. Between fending off an alien that can't be seen except by Van Gogh and enjoying some wonderful conversations with the troubled artist there are some moments that tug at the heart strings. Some of which concern the loss of Rory in Amy's life and Van Gogh's troubled mind. What shined in this episode for me was Van Gogh(a wonderful Tony Curran). There was one scene that brought me to tears and that is why I chose to put this episode in my top ten, not because of the slightly throwaway villain but because of the level of emotion in this episode that each actor conveys. My favourite moment, the moment where Vincent realises he has been accepted and it is absolutely heartbreaking because there is a little voice in your head saying, this never happened but it should have. Well deserved place at no. 5. Having a little drive about while being chased by sentient water. We're in treacherous waters now(sorry I had to). We're on the last legs of the 10th Doctor and things just go from worse to worse for our favourite Time Lord. He's lost all his companions and has been told that he will die soon. As a way to deal with this the Doctor has been running, faster than he ever has before. On his latest adventure he comes across a fixed point in time. An event which he is not allowed meddle in. It has been one of those rules that a Time Lord has to stick to. When sentient water begins to infect everyone around him and he begins to see needless loss of life he decides enough is enough. He realises that there is a reason he is the last of the Time Lords, he's not just a survivor, he is ever victorious. All of time and space should bend to his rule since he is the last Time Lord, but events go horribly wrong and he realise's for the first time, maybe he has gotten too old and maybe just maybe he has to die. What always interests me in a story is a hero who after along time of being a good guy turns into a quasi bad guy. That moment when the Doctor realises he doesn't answer to anyone, that he is basically God of all time and space, is one of those moments, and then he gives himself a new name "the Time Lord Victorious". I enjoy those kind of moments and I love that the writers were able to bring the Doctor to such a dark place in such a convincing way. It was a great set up for what was to come in the finale to David Tennants run as the Doctor. All the gang together, once last time. Right we're back to season 4, the Doctor is the 10th, the companion, every modern companion up to that date. That's right things just got interesting. Every hero has a team, it doesn't matter who it is they always have a group they can count on and the Doctor is no different. With this two parter we finally have the culmination of a story arc that I'd like to think began back in the Christmas special which introduced Donna Noble. All of the Doctors companions have come back to help him combat one of his oldest enemies, Davros, the creator of the Daleks. With the whole of creation in jeopardy the Doctor and his team will have to fight tooth and nail to win but there will be casualties. I'm always a big fan of teams. the X-Men, the Justice League you name it and to see everyone who has ever been with the 10th Doctor all in one place facing off against one of his greatest enemies was a treat to say the least. With wonderful performances(Catherine Tate in particular) heart stopping action and dazzling special effects this episode was fantastic. I'd love to know how much air was inhaled from all the gasps when fans saw this. Right it's season 7, the 11th Doctor and the companion is Clara Oswald right so let's get started. Everyone fears death. You would think a time traveller with 13 lives would be immune to that but in truth the Doctor is more frightened of his own death than anything else that he has faced in all the battles and wars he has been in. When Clara explains to him that his friends have been kidnapped by an old enemy and that he is holding them at Trenzalore, the place where the Doctor is buried. When the Doctor and Clara arrive they find the Great Intelligence(a long recurring villain in the history of the Doctor). He demands that the Doctor lets him in otherwise his friends will die. The way to get into the Doctor's grave? You must say his name and as we all know it is a rare breed of character that has access to that information. This is above and beyond one of the strongest episodes in Doctor Who history. With Moffat pulling every bit of history from the archives of the Who Universe, there are a ton of Easter eggs in this episode to gorge on. With Matt Smith on top form, this episode is one of his best and definitely one of the best of the whole series and that's all before that final scene. We're at a crossroads now. Still here? Great. The Doctor is the 10th, the companion, my all time favourite companion Wilf Mott(the fantastic Bernard Cribbins). The Doctor knows he is going to die soon and now he believes he knows who will be the instrument of his destruction. His nemesis, his antithesis, the Master(played with passion by Jon Simm).With Earth in jeopardy and the resurrection of the Time Lords imminent the Doctor has never faced such a personal threat in a long time. With this episode Russell T Davies pulled out all the stops to give everyone the farewell they thought the 10th deserved. With the Master and the entire race of Time Lords against him the 10th was up against the wall but with the absolutely fantastic Wilfred Mott at his side you felt he could take them on. The highlight of this episode was a scene between Wilf and the 10th which just broke my heart. I was in tears and I loved it. Doctor Who is a such a special series and this episode is a perfect example of that. Then he said those words, " I don't want to go". So there it is, 10 of the Doctor Who episodes that have touched my heart. I don't mind if you don't agree. What I do care about is your opinions, What are your favourite episodes? Who's your favourite companion? Who's your favourite villain? Most importantly though who is your favourite Doctor? I look forward to hearing everyone's experience with the 50th Anniversary Episode. Where will I be? I'll be in a cinema screen watching the episode. Where will you be?